Together We’re Bitter co-op is owned by seven worker owners and seventeen community investors, and is brewing up a storm in Kitchener. They have been able to thrive with community support and an extraordinary band of worker members that have expertise and determination for everything from brewing to taking a commercial Cadbury chocolate mixer and turning it into their “Hop Tub”. 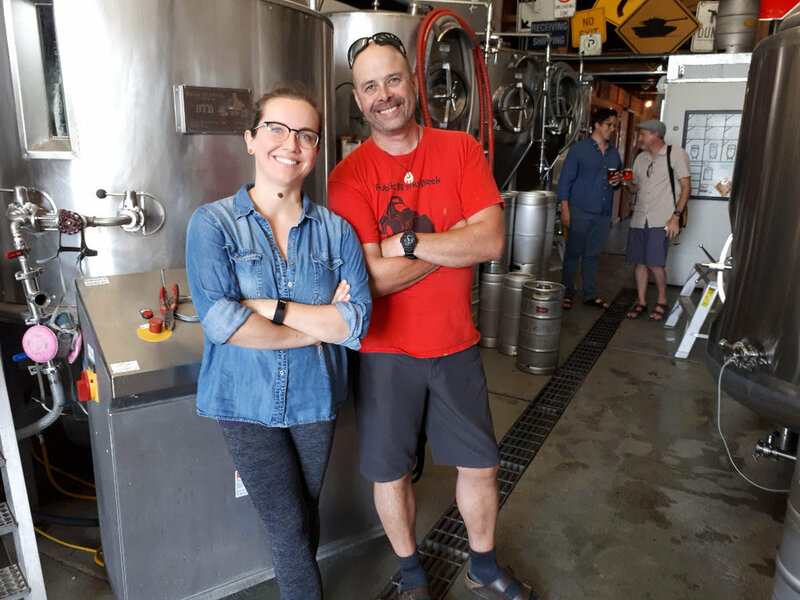 Starting a brewery is capital intensive, and they were not able to get traditional business development funding, even from a credit union; they had a successful Kickstarter campaign to get some equipment (the “People’s Fermenter”) and they went to the community for support. They have a welder and an electrician on their team, and everything was done in-house or by local artists, including the counter made from an old bowling alley, and the water heater made from an old lager-brewery from Croatia. Out of their small and lively space comes some great brews like Hydrocut (a portion of sale of this Session IPA goes to support community-run mountain biking trails), Wobbly Wheel (IPA) and Milky McMilkface a (you guessed it! Milk Stout). A couple of the recipes are aged in barrels (Sloppy Santa: Imperial Spiced Stout aged in rye barrels), Wry Old Elf: Old Ale aged in rye barrels) and there are the small batches too, so you never know what might be new there! Alex Szaflarska, one of the founders, says “With a co-op you get to build a team you really need and to leverage that”. Right now they do 700 litres on a brew day, about 1400/ week plus small batches; they are already pushing the limits of their current size. Since the space is small—all they could get with high prices downtown and zoning restrictions—they do lots of events and outreach, focusing on co-ops and community. Avocado Co-op uses their location as a pick up point. On Sunday they have live music (folk and bluegrass). Coming up soon they will be at the Hold the Line festival, a community festival to celebrate Waterloo’s Countryside Line on September 7th and 8th (check it out here: https://www.holdthelinewr.org/). Together We’re Bitter is in a small manufacturing area surrounded by residential zoning, and there was a constant stream of thirsty neighbours coming by as we talked. As we left with a good taste in our mouths and a smile on our faces, the place was packed. As Alex said, “the night is young and the fermenters are full!”. You can visit Together We’re Bitter at 300 Mill Street, Unit #1, Kitchener, Ontario or join the festivities at one of the many events where they are pouring.